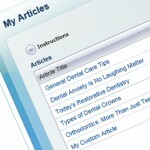 The articles that you write or select from our library will appear in the “Dental Info Center” section of your dental web portal. To select articles to appear on a particular web portal, please go to the “Selected Articles” section of the “Customize Portals” section and check the appropriate articles. Any articles you choose to make available to your patients will be displayed as part of the “Dental Info Center” on your web portal. You’ll see your list of articles at the top of the page. Click the trash can icon to remove an article from your library, or click the pencil icon to edit it. You’ll see that each article is assigned to a topic area. You’ll also notice that each article has a status of either “Draft” or “Final.” Your web portal will not include any articles with “Draft” status, so when you’re ready to publish the article, change its status to “Final.” The text of the article is shown in HTML, but you don’t need be a programmer to edit the text. All you need to know is that the little “p” tags indicate paragraph breaks. Uploading an article to the “My Articles” section does NOT automatically include the article in your web portal – that takes just one more step. In the “Customize Portals” section of the control panel, click “Selected Articles” to choose exactly which articles from your library will appear on that particular portal.